bump! what do you think Angelo?!? It gets to be way too much work getting the owners to change the format. What happens is that the sales people all come in and act like customers and tell us all how great the products are from XYZ company..So I'm going to say no on that idea..
No that's not what I mean. I was talking about personal sales not from companies. Like If I sold something to another forum member he/she can post a thread on what they got and if they got ripped off or if the sale was good. Things like that I get your point on the company thing tho. fake customers do tend to thrive on buyer/seller rating threads. I appreciate all that the moderators do/have done to help others and myself on this site, considering how frustrating it can be sometimes, especially when you have forum rules posted, but then have to move threads around due to improper location of original postings. Some of your "stickys" reveal those frustrations all too well, especially concerning where to post questions like, "How do I...? ", "Please help! ", "Need advice", etc. Like many other "newbies", I try to follow the rules as best I can, in hopes that my requests for help are answered promptly (if possible), and also so that I don't upset any moderators out there (respect). So, in the forum: Do-It-Yourself Section, where requests for assistance are NOT to be posted, under that heading it says "This section is for requests for DIY help, not for general technical advice." - The way I read that, if I was a DIY'er (which I am), and I wanted to make a request for help (which I often do), then I would seriously consider posting my question here, even though I'm supposed to read the sticky about not doing so (especially if I didn't read it). And, "general technical advice" is what I would be looking for, tho not in the same frame of reference that you intended here, I know...., but that's how it reads. No offense, but it is a bit confusing and misleading at first read. 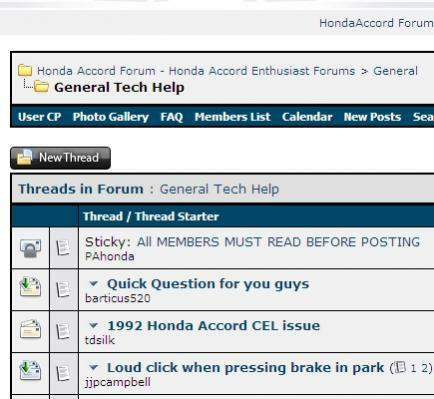 Then, in the forum: General Tech Help, where requests for help, answers, diagnostic advice, and possible answers to a poster's specific mechanical problem(s) are supposed to be posted, directions under that heading are: "Good at troubleshooting? Have a non specific issue? Discuss general tech topics here." - Again please, no offense, but "Good at troubleshooting?" tells me I'm in the wrong place if I need to ask for help diagnosing a problem with my car, and my specific mechanical problem probably doesn't belong in a forum designated for "non specific issue(s)", or where one would "Discuss general tech topics....", because frankly, I'm not looking for a "discussion" about my problem, (tho they often become that in the process), I'm looking (hoping) for answers. I'm just trying to help, not to be picky or sarcastic in any way whatsoever, but you may want to consider changing/rearranging some of this directional advice to new posters. More simple and direct instructions like, "This is for questions or advice about the problem(s) you are having. Looking for answers? We'll try! ", under the General Tech Help heading, and finding a way to take out "requests" and "help" in the Do-It-Yourself Section, would do the trick. For legitimate posts that are in the wrong forum, I normally move them without assigning any penalties. I save penalties & bans for people who post spam or worse. So as far as I'm concerned, don't worry if someone moves your post, it's probably in a better place for you to get a good answer. There hasn't been much success in making a difference between General Tech and DIY. Sometimes you want instructions to do it yourself, then change your mind when you realize it's over your head. Other times someone asks a question & later discovers that the job is pretty easy so she does it herself. It seems more convenient when all of these are in one place for newbies to search through. We want to save the "DIY" forum for things like step-by-step procedures and well-controlled information. The threads about "how do I fix this" which follow a winding path through the posters individual trial&error process; we want those over in General Tech. I never really understood or agreed with the description that says "have a non-specific problem". I wish we could completely re-write the descriptions that are visible on the list of forum areas. Our admin (Angelo) has tried. But we're stuck with writing things in "sticky" threads with titles like "YOU MUST READ THIS FIRST". Gotcha, I feel your pain. If not such a problem, then no need for solution. I wasn't particularly worried about it, but it seems that some are or have been, with all the "!!!" out there. K.
All the shouting & !!! was some kind of attempt to get people's attention in spite of the obsolete text that you pointed out. There's a "moderators forum" that you can't see, containing a big thread of discussion about this very issue. I am new and would like to post a question. How do I do that ? Well, select the forum that you're interested, for example General Tech. for most questions about how to fix something. Then click the "new thread" button at top-left.